My goal for September's A Lovely Year Finishes of was to make a second Staple Dress. I have been crushing hard on April Rhodes' dress patterns and when I came across this Liberty print, I just knew it was meant to be. Just before heading down to Sewing Summit, I polished off this dress and tossed it into my suitcase, ready-to-wear. My first take on this dress is in steady rotation and this second one is quickly becoming a wardrobe favourite. I'm noticing a trend that each time I finish a Staple dress, I take photos of it while visiting the U.S... the first one was in Seattle, the second in Salt Lake City.... Maybe I'll have to plan a few more dresses so I have more reasons to visits my friends to the south. At sewing summit I took a class with the lovely Elena, where she showed us how to make a metal frame clutch using frames and directions from Upstyle. I was surprised by how quickly this little purse together and how working with glue and metal frames was far from intimidating. I used a beautiful soft linen for the exterior and I love the subtlety of the French script. While I wanted the outside of the clutch to be all class, I knew I wanted something fun for the lining so I went for a bright blue scroll print from Joann's. 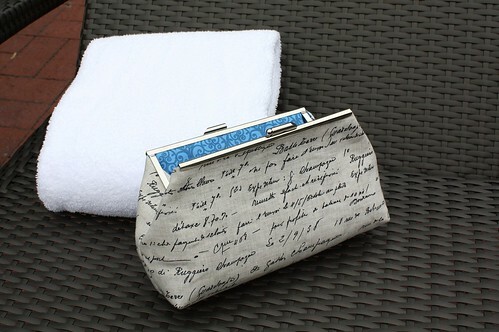 For a seemingly small clutch, it has plenty of space for a wallet, phone, passport, lipstick and car keys. I ordered five more frames upon my arrival home so you can be sure that there will be more of these in my future! Linking up my September finish over to Fiber of All Sorts. Pop on over to see some of the other fabulous finishes! I love it!!! What a fabulous dress. And the clutch is absolutely to doe for. I am enamoured with the fabric you choose. It looks fabulous!!! Hoping to get to Sewing Summit one day - sounds like so. much.fun. Impossible to imagine so many sewing minded people in one place having one heck of a good time!!! Lovely dress Kelsey. And I really love the clutch - the fabric is awesome! LOVE the dress! It looks so fantastic on you. The navy is great for your coloring! The clutch is great too. Metal frames and glue make me a little nervous, too, but maybe I'll try it someday after seeing your encouraging success. You look great in the new dress! Did you use elastic at the waist, or is that just the belt?